With more people having wood burning fires installed we have in recent months seen an increase in people finding unexpected visitors in the log basket! Here we have a photograph of a Forest Longhorn Beetle that found his way in to a property via the log basket – much to the surprise of the property owner! Generally, the type of beetles coming out of stored wood at this time of year will have been in the timber since it was alive, therefore the beetles are not interested in the now dead wood. As most firewood tends to be hardwood the range of possible beetle species is limited in this case we were able to identify the Forest Long Horn variety. 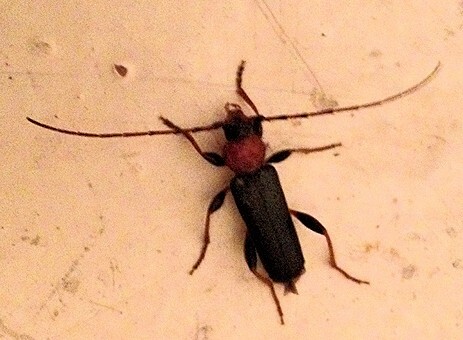 This type of beetle cannot re-infest dry timber without bark present and is not a risk to the house timbers. – To limit woodworm infestations in firewood, stack the wood so that air readily flows through the pile. Well-dried wood will not be as welcoming to beetles as damp wood. The drying process may also kill many developing larvae already present in the wood. – Piles of wood should not be stored up against buildings. It is suggested that firewood is stored at least 3 feet (if not more) away from a structure. – Keep firewood away from trees – This helps prevent any beetles, such as the Forest Longhorn Beetle, leaving the firewood pile and causing damage to living trees. – Never stack firewood inside – This helps to limit the chances of beetles and other pests taking up residence inside! – Try to use only local firewood – any wood that is not from a known local source should ideally be burned first to kill off any unwanted pests living within the wood. – Operate a first in first out a policy with firewood. This will help to keep unwanted pests to a minimum as this limits the available time for an infestation to build up. – Before bringing the firewood inside always give the logs the once over for visible signs of beetles and pests. Shaking the logs and banging them together will help remove any that are on the surface or starting to exit the wood. What should I do if I find beetles in my logs? If you discover beetles in your home that you think may be as a result of bringing in firewood it is important to identify what type of woodworm beetle it is to determine what action (if any) is necessary. Timberwise have specialist timber surveyors who are experts in identifying different beetles and are experts in providing woodworm treatment. If you are concerned that woodworm could be affecting your property then read our guide on how to treat woodworm?. Contact your local Timberwise team on 0800 288 8660 for helpful advice.